On 21st of September VšĮ Žmogiškųjų išteklių stebėsenos ir plėtros biuras hosted an international final Erasmus+ Strategic partnerships project INforEX (www.inforexproject.eu) conference – „Innovative ways of including low qualified persons into the labour market“. We are glad that the theme of the conference gathered together more than 100 participants who came from different cities in Lithuania – Vilnius, Tauragė, Kelmė, Kėdainiai, Rietavas, Joniškis, etc. The conference caught the interest of social workers, specialists from social services centres, labour exchange office, labour market training centres, university lecturers, etc. Speakers also made presentations on the validation of competences acquired in non-formal education / training as well as the growing importance of social competences in present labour market. 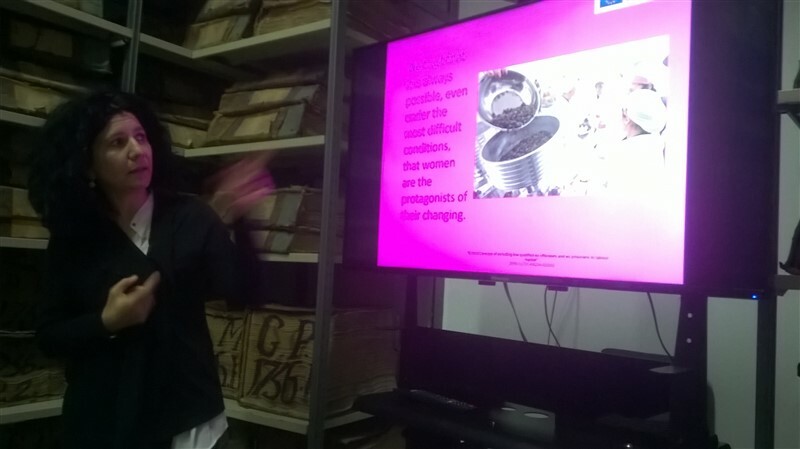 A representative from Italy presented a social business operating in Pozzuoli women’s prison in Naples where women process coffee beans and have a chance not only to acquire work skills but also earn some money for their families outside. A colleague from Spain spoke about social enterprises as an opportunity for young people to get employment and good practice examples in Madrid. 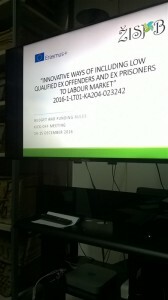 Presenters from United Kingdom and Poland delivered presentations about programmes offered for ex-offenders’ integration into the labour market. It is interesting that in some cases ex-offenders upon release become active participants in providing support for this target group – help to overcome addictions, consult on social and work issues, etc. Representatives of Lithuanian organisations presented employment measures for low qualified persons, an international project for NEETs (24-29 years old) where young people will have an opportunity for on-the-job training for 6 months at a social enterprise, a regional ESF project for integration into the labour market for socially excluded persons and other innovative social and work integration methods used in Lithuania (for example, comics, career mentoring methodology, psychological and coaching methods of empowerment, etc.). Conference presentations are available in Lithuanian and English on the project website http://inforexproject.eu/lt/english-outputs/english-conference/. For more information about the project and the conference please contact Tel. No. +37067688421 (Mrs. Gintarė Černikienė). 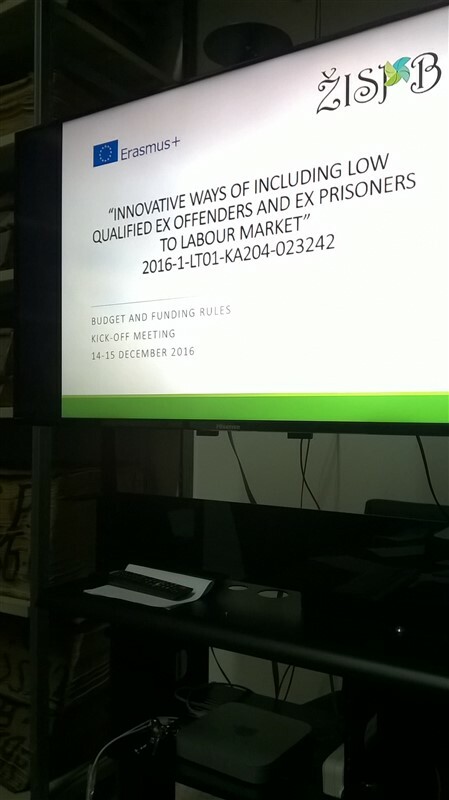 Project INforEX – “Innovative ways of including low qualified ex offenders and ex prisoners to labour market”, Erasmus+ KA2 Strategic Partnerships project No. 2016-1-LT01-KA204-023242, project duration 01/10/2016 – 30/09/2018. INforEX is a European project funded by the Erasmus+ programme that aims to improve the employability of ex-offenders / ex-prisoners. Organisations from 6 countries (Lithuania, Poland, United Kingdom, Spain, Italy and Cyprus) have joined into a consortium to contribute solving this issue. INforEX partnership has developed an integrated on the job working methodology that would enable ex-offenders with low qualifications to gain necessary social and work skills that are necessary for the today’s employers. The methodology on the training programme involves three parts – training providers, entrepreneurs and ex-offenders or ex-prisoners. The training providers act out as intermediary body between entrepreneurs and ex-offenders / ex-prisoners and trainers of both parties. Due to the certain peculiarities of the target group (i.e. ex-offenders and ex-prisoners), the preparation of trainers was considered as necessary. For this reason, from 9 to 13 October 2017, GINSO (partners from Spain), with the collaboration and support of the consultancy K-veloce I+D+i (http://kveloce.com/) organized the “Train the Trainer” workshop at its headquarters in Madrid for project partners. Furthermore, to finish the productive and satisfactory event, a visit was made to the “Teresa de Calcuta” Children’s Center, in order to advertise and learn about the model of training and job training conducted with juvenile offenders in the Community of Madrid, as a model of good practice. 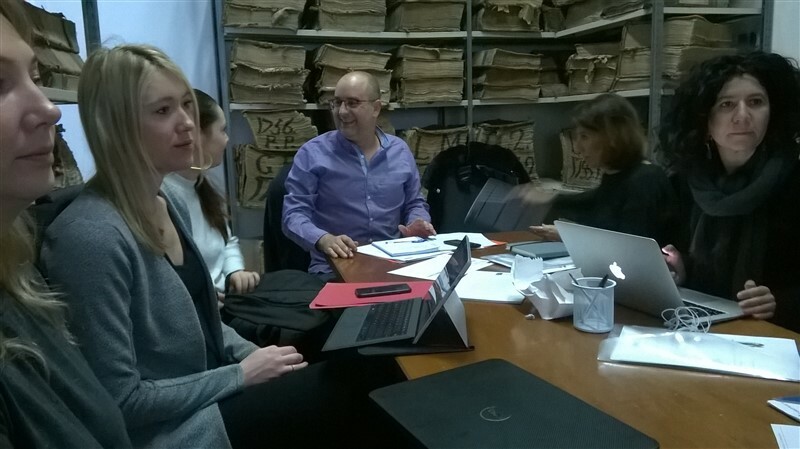 Next project step – to deliver training for entrepreneurs locally (each partner – to involve 12 enterprises) to share knowledge gained in Madrid. Each entrepreneur will train at least 2 former offenders or prisoners. As a result, 144 ex-offenders will be trained a concrete job and given a certificate and reference letter to help them further in their way to the labour market. The project involves six partner organizations from six European countries: VšĮ Žmogiškųjų išteklių stebėsenos ir plėtros biuras (Lithuania), Eurosuccess Consulting in cooperation with the Cyprus Prisons Department (Cyprus), CASCAID (UK), Lazzarelle Cooperativa Sociale a r.l. (Italy), Collegium Balticum (Poland) and Gestión para la Integración Social -GINSO (Spain). The Europe 2020 strategy for smart, sustainable and inclusive growth sets targets to lift at least 20 million people out of poverty and social exclusion and to increase employment of the population aged 20-64 to 75%. Among those who are on the verge of poverty are also ex-offenders / ex-prisoners who face multiple problems: stigma, negative attitude by the society also lost work skills and / or low qualification. The situation is that the employment rate of the low qualified is nearly 80% lower than the employment rate of individuals with university level qualifications. Even though there is no exact data on the qualification levels of offender / prisoners, it has been estimated that only 3-5% of them would be qualified to undertake higher education. Low levels of qualifications have important negative effects on ex-offenders / ex-prisoners’ employment prospects upon release, which has been found to be one of the key factors influencing whether or not they re-offend. In addition to possibly having low qualifications, ex-offenders / ex-prisoners face a number of other barriers to securing employment, including lack of experience in the work environment and also prejudice – having a criminal record is a key barrier to obtaining a job. Post release license restrictions can also prevent a person from taking up a particular job or moving to a new area to look for work, thereby reducing their mobility on the labour market. Yet, some researches show that being in employment reduces the risk of re-offending by between a third and a half. With employment playing an important role in influencing the chances of ex-offender / ex-prisoner’s re-offending it is crucial to try to address their skills gaps through the provision of learning opportunities which provide skills and competences, relevant to the (local) job market. 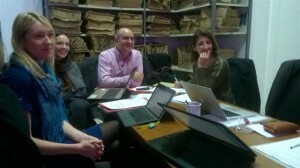 In order to improve the employability of ex-offenders / ex-prisoners, organisations from 6 countries (Lithuania, Poland, United Kingdom, Spain, Italy and Cyprus) have joined their forces in the Erasmus+ project INforEX (www.inforexproject.eu) to create on the job training programme that would enable ex-offenders with low qualifications to gain necessary social and work skills that are necessary for the today’s employers. 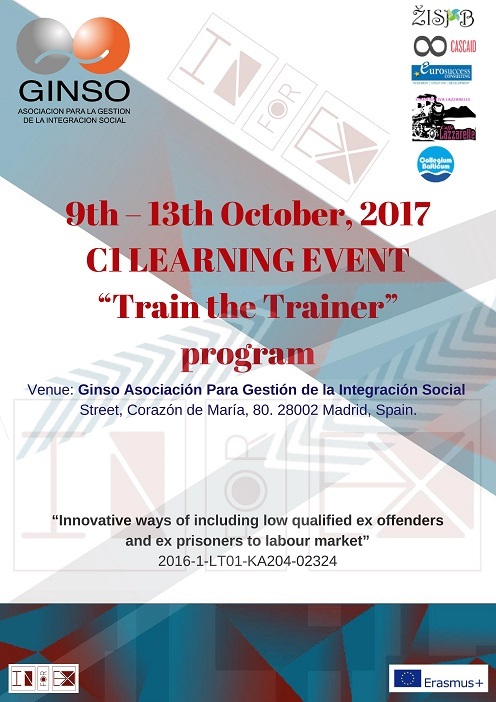 Due to the certain peculiarities of the target group, the preparation of trainers who will be responsible for monitoring the ex-offenders / ex-prisoners’ training within the premises of a company is necessary. The created training programme links to the created resources for training providers to discuss with employers the communication aspects with ex-offenders / ex-prisoners, social and psychological factors of working with them, the challenges that the on the job trainers might encounter. The programme advises to have at least 40 hours of employers’ training. Another important aspect of the training programme is that it is based on the concrete work the entrepreneur needs – a job position description (distinguishing skills, knowledge and competences required to perform a certain job) is formed which is the basis of further training of ex-offenders / ex-prisoners. What is more, partners within the project have anticipated that prior to matching the ex-prisoner with the company, the training provider has to do the initial training with ex-offenders / ex-prisoners – to assess their skills so as to match with the available job training position and to work on their low self-esteem, (self)-confidence, basic life skills, effective communication, work culture to make the transition to the on the job training easier. The innovative aspect of the created methodology is that the participant gets a certificate for skills, knowledge and competences gained (based on Level 3 of EQF) even if he/ she does not complete the whole training path (while the whole training process consisting of 320 hours). Currently partners are planning the piloting of the created programme where 144 ex-offenders / ex-prisoners will get their skills certified and hopefully the experience gained during the training will increase their possibilities to get employment or some of the participants will be offered a permanent job at the place of the training. 14-15 December, INforEX partners’ meeting was held in Naples, Italy. The representatives from CASCAiD (UK), GINSO (Spain), Lazzarelle (Italy), Collegium Balticum (Poland), ŽISPB (Lithuania) met in person to start officially the project, discuss the upcoming activities, plan the next steps. The coordinators of the project paid a lot of attention to present the whole project, its changes and finances as well as administrative matters, redistribute some tasks among partners. 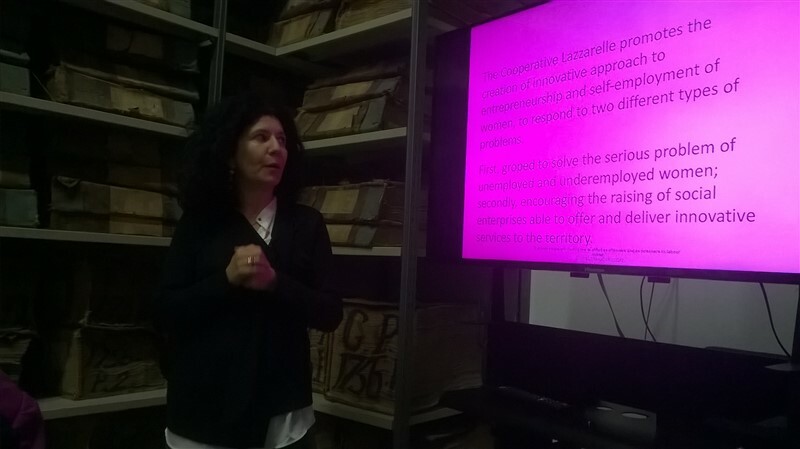 Partners from Cyprus during the videoconference presented the guidelines for the needs analysis and focus groups in order to have a solid basis for the creation of training and certification model. Two days were spent productively and effectively. Next steps – to meet relevant stakeholders (representatives of vocational training centers, employers, labour exchange offices, etc.) and identify what skills are missing and in which direction INforEX project should turn in order to meet the needs of unqualified exoffenders and employers.